Sonic the Hedgehog 24 is the twenty-fourth issue of the Sonic the Hedgehog comic series. It was released in July 1995. This comic features one story: When Hedgehogs Collide!. A pig is hanging around a mud pond, when Sonic the Hedgehog, appearing more evil than usual, kicks the pig into the pond. He runs away, insulting the pig, leaving the pig confused. Elsewhere, a squirrel is fishing at a pond when Sally Acorn walks up. The squirrel asks Sally if she wants to join her. Sally quickly grabs the seat the squirrel is sitting on, knocking her into the pond. Sally walks away, telling her to 'go fish'. Back in Knothole Village, Antoine, driving a car, recklessly crashes into many vendors. A dog selling apples thinks Antoine must be in a hurry, until he backs the car up and smashes the dog's apples. In another vendor, Rotor starts swinging a bat around, ruining merchandise. Claiming that he doesn't have enough room to swing a bat, he gives the bewildered vendor a ticket. A turtle, meanwhile, is running away from Tails, who is chasing him down. The turtle runs out of energy. Tails catches up and throws tomatoes at the helpless turtle, then flies away. He enters the Great Forest, where he meets up with the others...the anti-Freedom Fighters run by Evil Sonic. Evil Sonic and Anti-Sally Acorn wait beside a motorcycle as Anti-Rotor and Anti-Antoine arrive as well. Their plan: to give the Freedom Fighters a bad image, has been a success. To explain the story, the comic goes back a few hours, as Evil Sonic sits in an office, playing with darts, and complaining about being bored. He throws a dart at a dartboard with the likeliness of the regular Sonic, claiming that the only exciting things occur when they both meet. He then looks outside to see a Swatbot cleaning the sidewalk as Anti-Antoine and Anti-Tails walk by, littering. With Anti-Robotnik being a wimp, there's no challenge for them. Suddenly, Anti-Sally bursts into the room and kicks Evil Sonic to the ground. This Sally has the same problem as Evil Sonic: she wants a challenge. Sonic gets an idea, and recalls his first encounter with Sonic the Hedgehog after he came through the Cosmic Interstate. He then mentions his next encounter with assistance from Robo-Robotnik. Both times he lost, making him angry. He storms into Anti-Rotor's shop, telling him to round up their group. With their vehicles, the Anti-Freedom Fighters take to the Cosmic Interstate, locating the regular universe. The group arrive on Mobius. They take off their leather gear to fit in as the regular Freedom Fighters and go about wreaking havoc. Where are the normal Freedom Fighters though? The normal Sonic, Tails and Antoine are going through an interdimensional portal, then arriving in Rotor's workshop. The portal was designed to send a person to the Zone of Silence, an area of space where Maximillian Acorn was exiled by Robotnik. The group had entered the Negative Reality where the zone was, but couldn't get into the zone itself. Sonic then takes out NICOLE, blaming her for not helping out on their journey. NICOLE barks back, stating that the Negative Reality affected her software. Sonic then notes to the group about not telling Sally about their lack of success, just as she walks in. Sally, having returned from her adventure with Geoffrey St. John and her other Freedom Fighters, wants to know what has happened since she left. Before they can tell her, they hear some commotion outside the lab. Sonic opens the front door, revealing a whole group of angry Mobians. One of the older members of the group nearly prods Sonic with a pitchfork, while the others start placing blame on the group for the actions of the anti-Freedom Fighters. They then start throwing food at the fighters, so they decide to go away and figure out what exactly has happened. Later, in an area of the Great Forest, the group contemplate why the others are angry at them, realizing there must be some impostors around. However, if there are, they need to prove it. Sally gets an idea, and huddles the group together to explain. The anti-Freedom Fighters are at it again, as they terrorize a part of Knothole with their vehicles. They look over and see a group of 'gypsies', deciding to target them next. Unknown to the anti-fighters, the gypsies are Sonic and his group in disguise. Sonic sarcastically calls out to Sally that the group are coming to terrorize them, signalling her to fire a tripwire. The anti-fighters can't react in time, as they hit the tripwire with their vehicles, sending them flying into the Freedom Fighters. Sonic, in disguise, walks up to Evil Sonic and taunts him. He throws a punch at the disguised Sonic, who avoids his punches easily. After a few missed punches, Sonic takes matters into his own hands and punches Evil Sonic easily, then takes off his disguise, along with the others. Evil Sonic regroups his fighters, as each anti-fighter takes on their respectable counterpart. The fight continues on for some time, as Sally notes that the fighters are getting nowhere as they know eachother's moves. Out of the blue, Sally gets an idea, and yells out for her group to change partners. The Freedom Fighters push their opponents toward another fighter, leaving them disoriented and confused. They use this confusion to their advantage, and easily take out their counterparts. They tie them up, except for Evil Sonic, and present them to the residents of Knothole, proving their innocence. As Sonic tells the disoriented Evil Sonic that he's going back where he came from, Evil Sonic quickly notes that he got what he came for: a fight. He then faints right in front of the others. Sally asks Sonic how he can live with himself. He notes that it isn't easy. Evil Sonic returns, while the other anti-Freedom Fighters are introduced. Although they are named, and look exactly, like their normal counterparts, they'll receive different names and styles in later issues. Knothole's styling is changed in this issue, featuring more civilians and a more open village, including residential areas and a marketplace. Unlike previous issues where the civilian population is hidden or not acknowledged often, the Knothole atmosphere seems more open than shown prior. This issue takes place after Princess Sally #3. 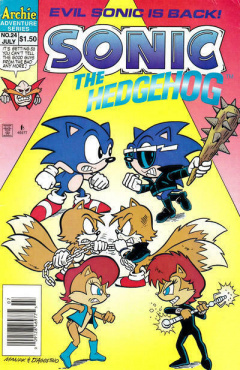 The Sonic & Knuckles special comic takes place after this issue. The Knuckles Mini-Series and Tails Mini-Series are introduced in Sonic-Grams.